Yes, this is a book about God - who he is, who he's not, and the staggering implications of who we are as a result. But no, this is not just "another" book about God. God Has a Name is shaped around one incredibly important paragraph in Exodus. In the well-known story of Moses interacting with God on Mount Sinai, Moses asks to see God's glory. But what God does - and says - is surprising and relevant for anyone who wants to understand God today. Comer's fresh voice, creative and contemporary examples, powerful language, and deep respect for the scriptures open up the Bible and the story of God to reveal not only his character but how he interacts with us. And in the end, we will know how to "carry that name" ourselves and represent God in how we live. For everyone who is trying to understand this God the Bible talks about, the church teaches about, and preachers preach about, this is the place to begin. Ground zero - where God himself tells us who he really is. 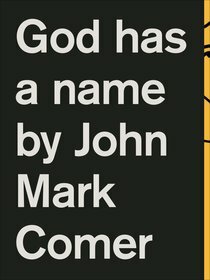 About "God Has a Name"